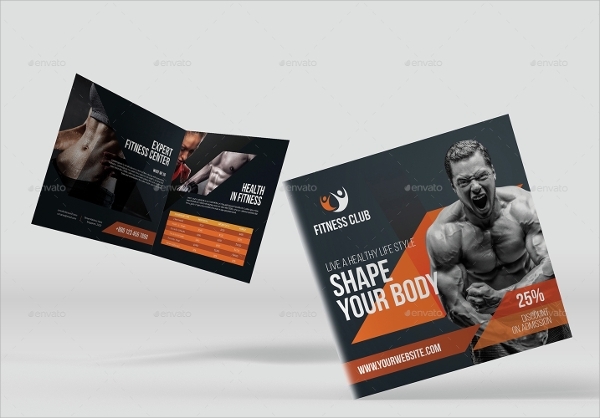 Gym brochure design is one of the most required aspects you have to think of to make your gym popular. You must make a good brochure so that you may get visitor attention, and turn the visitors into customers. To make this happen you can start by hiring a designer, or may try it the other way. This is the shortcut way where you use a template, which helps you get the same design in a better and professional look in the shortest time and without as such any large investment. You may check Fitness Brochures. 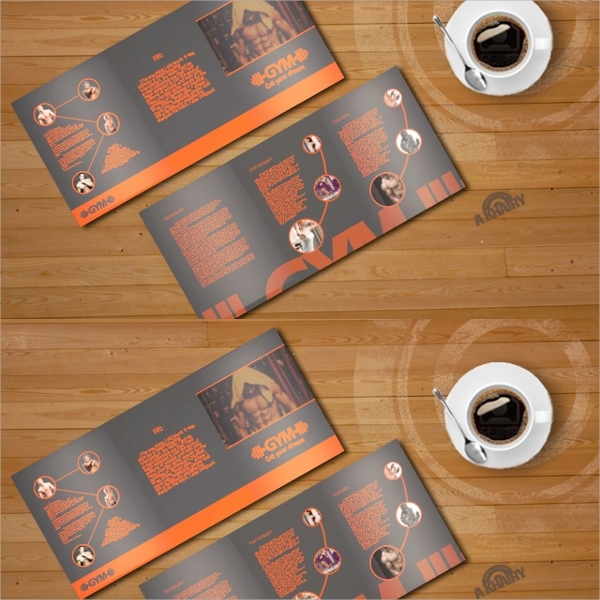 The 22.25 x8.75 inches template design is 300 dpi, completely editable, and the color can also be changed as you need. You get a bunch of nice design showing a well-sculpted body. Get this design in CMYK colors and get wonderfully designed brochure template also get a well-documented guide with this that facilitates editing. 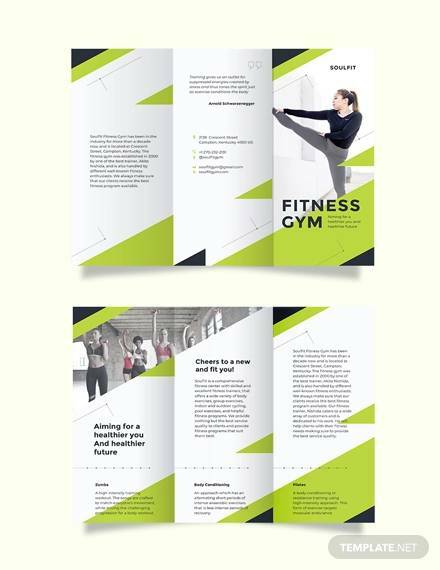 This is a brochure in the infographics format and you can use this in a fun way to show how you would be training people with a personal trainer in your gym. 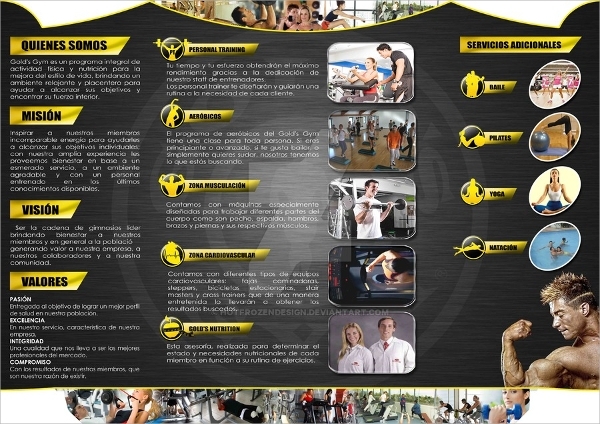 The brochure looks nice with the inclusion of the body of a personal trainer, and you would love to show it off. 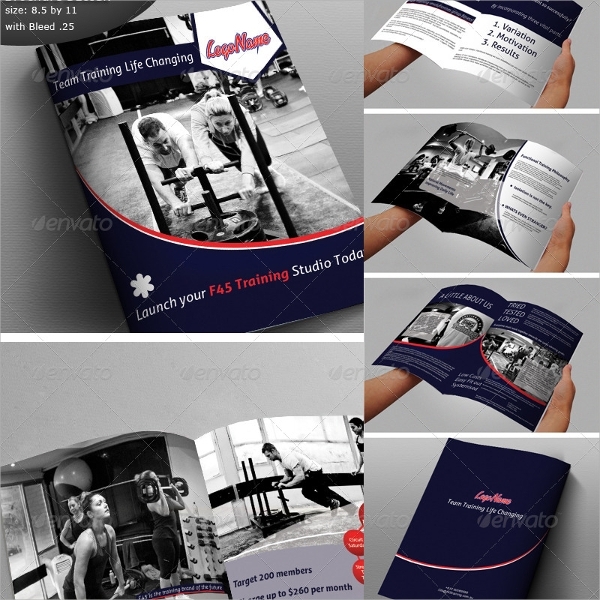 The trifold design is a typical nice brochure design with picture option where you may add the gym infrastructure snaps and personal training pictures. 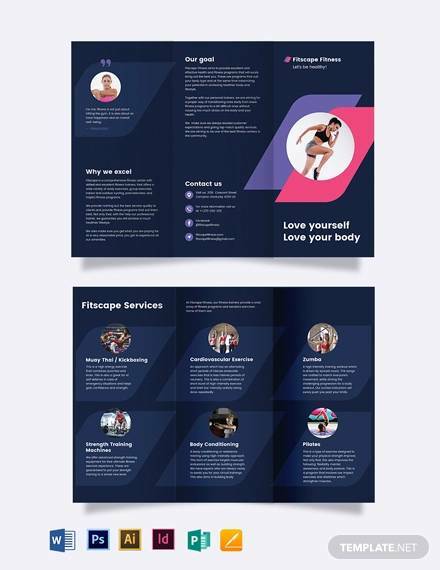 This template is for the men’s gym, and the brochure has a bright design with magenta and blue, and a square shape. The smart and professional design looks really great, and the navy blue color with white wherein you may add images and details looks great. This is a men’s body gym template or brochure. The color schemes can be changed. The resolution is 210×297 inches. 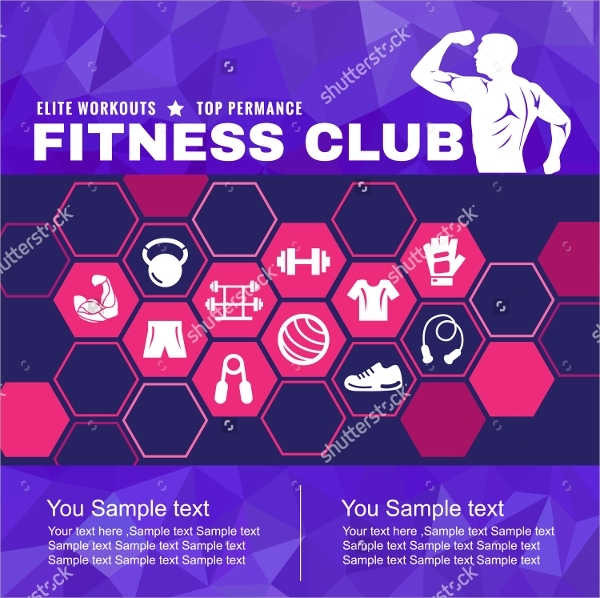 A smart and beautiful template which is apt for a unisex gym, and the pictures are embedded on a very dark background this making the look bold. 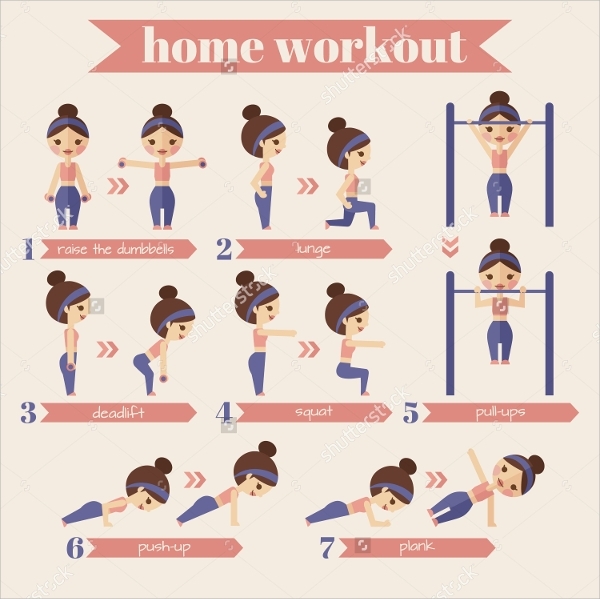 The single sheet template, which has a nice and presentable design, is nice for personal body training as well as a multigym. A plain and simple design but with a new definition wherein the vermillion colored fonts look extra bright over the matte black background. 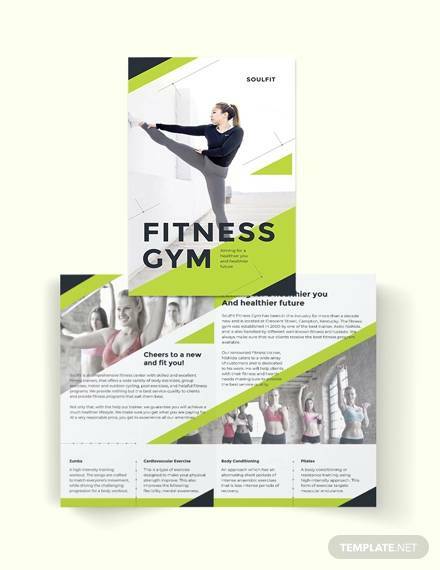 The multicolored foldable brochure design has a lot of yellow and some black in it to make the design prominent and bold. 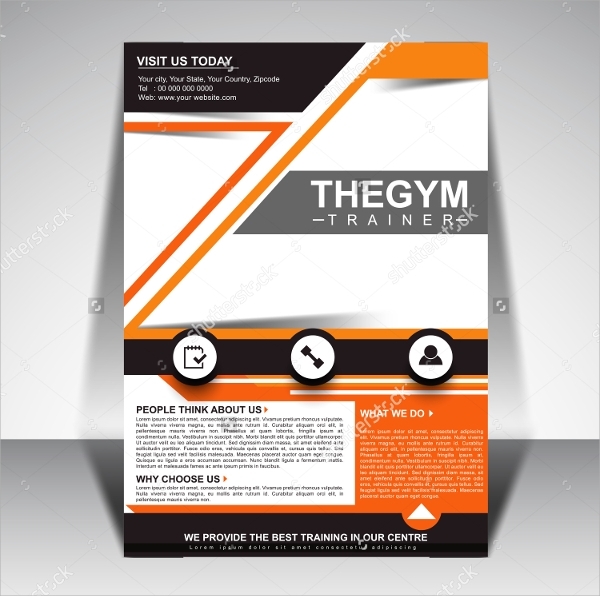 It’s a complete template design, where you can add everything about the gym, from infrastructure to timings and training process and trainer names etc. 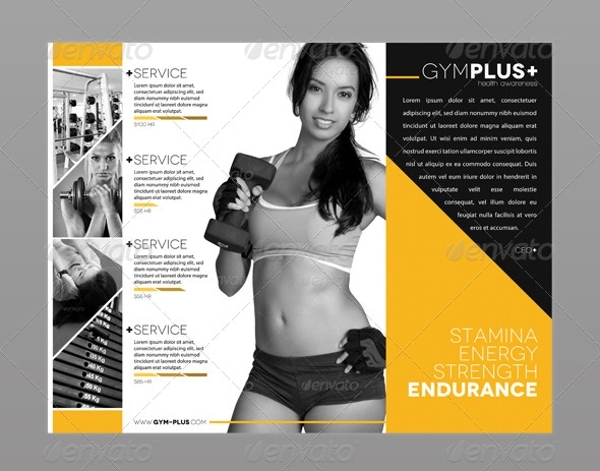 The yellow and white based nice designs are great to make a fantastic gym brochure, and its foldable. This template is one of the best designs in red, and the simple minimalist design looks powerful. The template has multiple colors and divided looks within the same page. This makes it easy to make segments of information and present it better. The template is based on smart and abstract design, wherein the information is given more importance than visuals and photos. 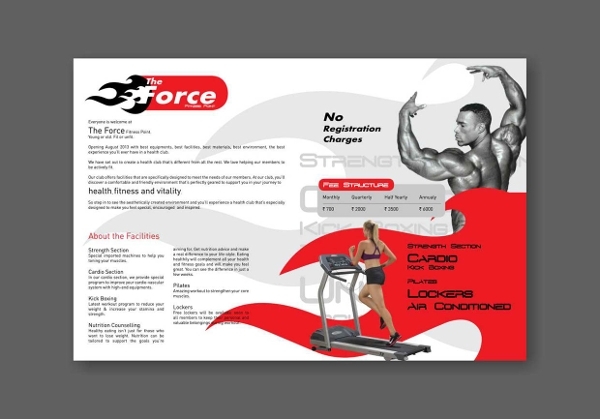 The well toned body of the gym trainer looks great in the brochure design. The smart and dark design brings in lot of customization options. 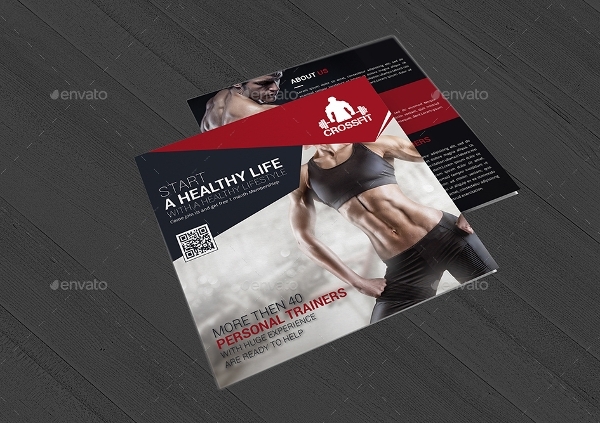 This is a nice and simple design where the toned bodied personal trainer looks smart invites for the ultimate fitness course. The smart and professional design is based on information mainly, and it looks great without even a photo. These brochure templates are all made to comply with your designing needs, which you may customize easily and edit and personalize with fun and excitement. 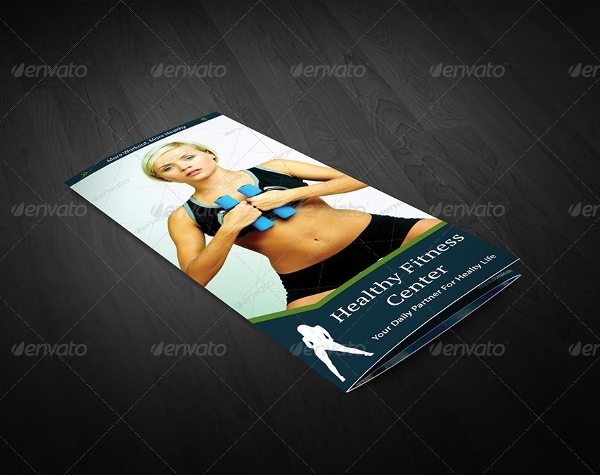 Get them to make your Gym franchises advertisement and brochure ready in just minutes. These are available in various easy to use formats.